Gravebone for the most part remains the same in Shattered Fates but he has a general increase in the speed of his game. He relies on his allies to control the board and win the game. Shatter Fates introduced many allies and tools to help Gravebone, however the new discard mechanic has been the largest factor in the growth of Gravebone, reducing his deck speed from slow to medium. Before SF, Gravebone had to wait until turn 6+ before he could effectively use his ability on a consistent level which made him extremely slow. He had to constantly minimize the amount of damage taken early so that he could transition into the mid-late game. With SF a plethora of discard options have become available which have help shaped the speed up and flexibility of his game. Now he can consistently use his ability by turn 4 (with SBO as early as turn 3). Cryptspawn Tormentor (3cc – 3/4) When Cryptspawn Tormentor is killed by an ability while there are at least 2 Undead allies in your graveyard, Cryptspawn Tormentor is returned to its owner’s hand. 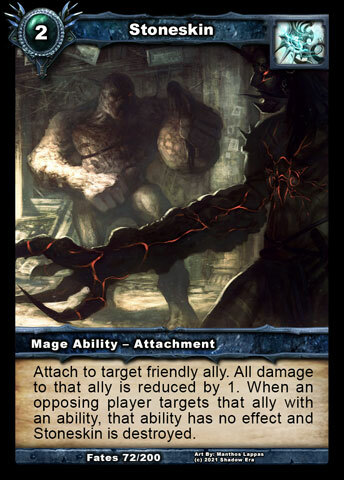 Slingblade Demon (3cc – 3/3) When Slingblade Demon is summoned, you may return target other friendly ally to its owner’s hand to renew 2 resources. Belladonna (4cc – 4/2) When Belladonna is summoned, draw a card. Wulven Tracker (4cc – 2/4) Wulven Tracker is a wolf ally. When Wulven Tracker deals damage, draw a card. 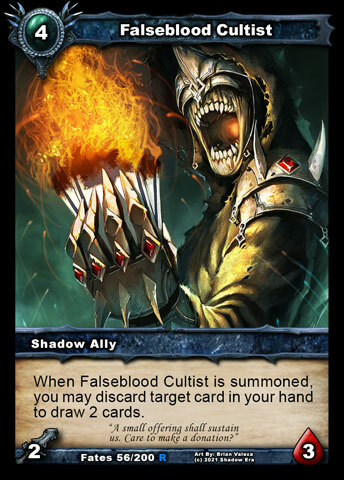 Falseblood Cultist (4cc – 2/3) When Falseblood Cultist is summoned, you may discard target card in your hand to draw 2 cards. Der’kan, the Bone King (4cc – 3/4) When Der’kan is summoned while there are at least 3 Undead allies in your graveyard, target hero or ally takes 2 ice damage. When Der’kan is killed while he is the only ally you control, he is returned to your hand. Shadow Knight (5cc – 5/4) When Shadow Knight is summoned, return the top ally from your graveyard back to your hand. Darkwood Wraith (5cc -2/5) When Darkwood Wraith is summoned, target ally with a cost of 3 or less is returned to its owners hand. 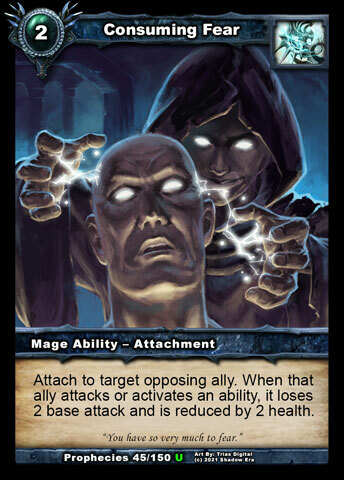 Undying Bond (4cc) The top 2 allies in your graveyard are placed into your hand, and your undead allies have +1 attack until the start of your next turn. All Hope is Lost (1cc) Target opposing hero takes 5 unpreventable damage if its controller’s deck is empty. Draw a card and then place All Hope is Lost on the bottom of your deck. Sacrificial Lamb (2cc) Sacrifice an ally. Draw cards equal to that ally’s cost, to a maximum of 3. Here Be Monsters (3cc) Destroy an enemy resource if they have equal to or more resources than you. Draw a card. Overwhelm (5cc) All opposing heroes and allies take 1 damage for each ally you control. Draw a card. Word of the Prophet (1cc) Up to 3 cards in your hand are shuffled into their owner’s deck and then you draw the same number of cards. Bad Santa (2cc) Both players draw 3 cards, up to their maximum hand size. Melt Down (2cc) Destroy an item you control. Draw two cards. Master Smith (4cc) Return any weapon or armour from your graveyard to your hand. 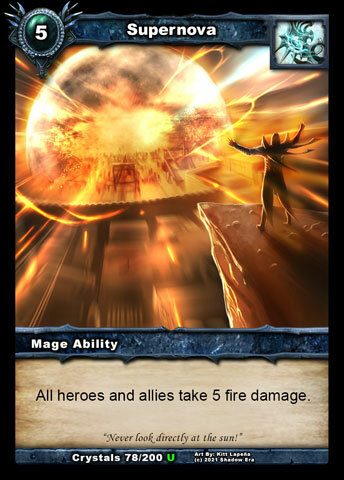 Ley Line Nexus (5cc) Destroy target item with cost 5 or greater. Draw a card. Bloodthirsty (3cc) While Bloodthirsty is attached to target friendly ally, that ally has +1 attack and each time it kills an opposing ally it gains +1 base attack and you draw a card. Confluence of Fate (2cc) Sustain: 1HP. Attach to your hero. At the end of each of your turns, draw a card for each attachment you summoned that turn, to a maximum of 2 cards per turn. Tome of Knowledge (2cc) 2: Draw a card. Vial of Conjuring (4cc) 1SE: Draw 3 cards and remove 1 of your resources from play. Tombstone Beacon (3cc – 3d) 1D: If you summoned an Undead ally this turn, 1 of your resources is renewed and you draw a card. Loom of Fate (1cc) 1: All players draw a card. Bazaar (2cc) Ongoing: Each player draws an extra card at the start of their turn. Crystal Shards (2cc – 4d) Any player may activate the following ability on their turn: 1D: Discard a card from your deck and draw a card. Aldmor Conduit (3cc) Any player may use the following ability on their turn. 1SE: Draw a card. Looter’s Baton (5cc – 1/4) When your hero kills an ally in combat, draw a card. Flameforged Gauntlets (3cc – 4/1) 1D: If an opposing hero or ally was dealt fire damage this turn, draw a card. Twice-Enchanted Robes (5cc – 2/3) When your hero takes damage, draw a card. Loest’s Burden (7cc – 4/2) At the start of your turn, your hero takes 1 damage. When an opponent uses shadow energy, you draw 2 cards. 0SE: Your hero takes 2 damage and you draw 2 cards. Infernal Gargoyle: The original hard to kill. He’s still a great ally but Grimhast fills a better Primary role for combat damage reduction. Plasma Behemoth: Big damage actually become much scarier as a possible turn 4 drop, or double drop on 5. Get 2 of these to stick and its a quick good game. 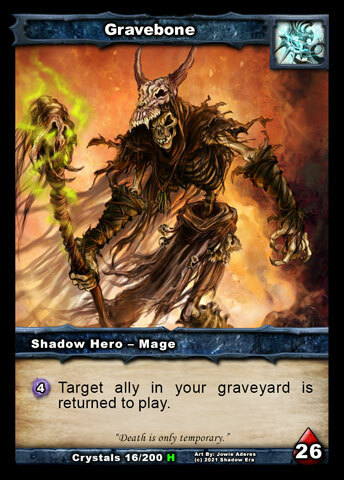 Shadow Knight: Still a great ally for Gravebone. The new discard mechanism actually increases his value, though he can at times be counterproductive to his tribe members that have graveyard requirements. Note: Molten Destroyer has been one of my favorite cards, up until SF. Dakrath is a much better defensive fatty and has higher Attack too. 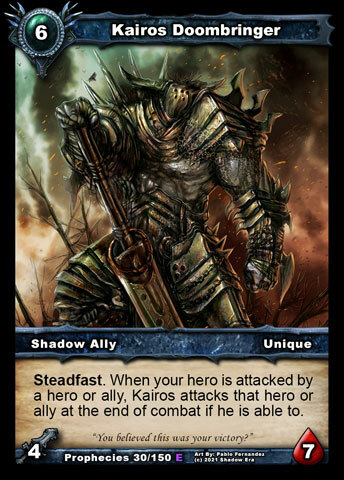 Ironhide Karash: Loses out to Harbinger because of the discard option, however he still a valuable ally to Gravebone. Morbid Acolyte: I actually think he squeezes ahead of gargoyle as the next in line to Grimhast. Removing passives is really needed to deal with a number of allies, specifically the one that are hard to kill. Death Collector: He’s your key ally to stopping recursion decks and helping slow graveyard requirements for opposing Undead decks. Sun-Blighted One: Being a turn 3 ally he can actually help Gravebone get a turn 2 discarded ally revived by turn 3. He can also be used as a pseudo fatty (revives with SK stats). The accelerated ping from summoning and reviving can really add up too. I actually downgrade him from DP since more heroes with 3SE have been introduced and Zaladar / Victor have become really bad matchup for SBO. Kairos Doombringer: I am loving Kairos in SF. He already has steadfast and basically is a weapon for GB. With SF we are introduced with stoneskin and Grimhast, which help reduce damage Kairos takes during retaliation. Also fatebreak familiar acts as ability blocker for 3cc and below control. Harbinger: provides early board presence with potential to get an ally in the graveyard as early as turn 2. One of the largest factors in speeding up Gravebone’s game. Fatebreak Familiar: Shadows Puwen. This guys strength lies in his ability to protect your other key allies from cheap removal. Also can block cards such as Blood Frenzy, and in general creates some preemptive advantages against warriors. Grimhast: The reverse Aldon. Basically he turns all your allies into gargoyles against combat damage, but unlike Aldon his ability works on both offense and defense. Usually when he hits the board he is a high priority for removal. Falseblood Cultist: IMO the best ally Gravebone received in SF. He cost 4 which times him perfectly with Gravebones ability. When he is played he creates 3 specific advantages, he’s a body on the board, he has specific discard and he draws 2 card. This is great tempo that Gravebone needed to elevate his level of play. Phoenix Urigon: Mr never die. The 2 lives he has is absolutely amazing, then you can revive him and do it all over again. This creates quite a few combo options such as nova board wipe or sac lamb to receive an additional advantage yet keep an ally on the board. His initial state is not super threatening so often opponents will ignore him. Rampant Krygon: Basically he is a stronger DMT. I don’t particularly use this guy but he has some great utility. His ability is actually health reduction. Flameborn Defiler: Revive him and drop a nova. Instant way to deal with even 6hp allies with capabilities of doing even more damage over time. Infernous: Nice alternative fatty. 6/6 stats with steadfast what’s not to love. He even buffs fire damage to opposing allies. Dakrath: There is just so much to love here. He’s basically a Sandworm on steroids. Aside from the good stats and defensive capabilities, he also can’t be frozen or disabled which increases his utility. Fireball: Still my favorite ability in the game. 4 damage for 3cc is awesome. Lightning Strike: 3 damage to 2 targets is pretty decent but not an auto include for me. Great against stealthed rouge allies since they all have low hp. Pretty much all other allies still need assistance to deal remains damage. Supernova: board wipe + revive fatty. The original combo still as good as ever, however there are now many allies that survive the 5 damage. Tome of Knowledge: Not one of favorite draw engines for GB. Generally early game is more about board precense so it’s not until mid-late game before you can actually use it. There are now lots of draw engines that have mutilple uses for other draw costs which can be more effective. ToK is still a valuable card in the right deck. Sacrificial Lamb: This is a great draw card for Gravebone. Turn a crippled, disabled or soon to die ally into cards and revive him with Gravebones ability. Alternatively you can use GBs ability for the revive and play sac lamb on him to dig for key cards in a pinch. Note: Dagger of Unmaking has lost much value with the increase of summon allies, damage reduction by allies and availability of transmogrification curse. Note: Portal has lost much value with Gravebone in DP and losses even more with SF. The availability of Bone Saber provides so much more flexibility in regards to psuedo-haste even though it’s restricted to Undead builds. Note: Consuming Fear use to be a good control card for GB but it’s no longer as effective. Stoneskin: actually a much needed card for Gravebone. Damage reduction is nice but canceling a target is the strength here. This prevents hero abilities, mc, TPS, etc which are all things that can make your fatty disappear quickly. Of course this can also be disarmed from a sleuth of other things as well, Dmt ping, Jasmine booty shake, etc so opponent has some affordable ways to keep it in check, but it does help towards slowing opponents pace since they have to dedicate 2+ sources to deal with the target now. Transmogrification Curse: Instant removal by converting an ally into an item, not limited to any hp count. 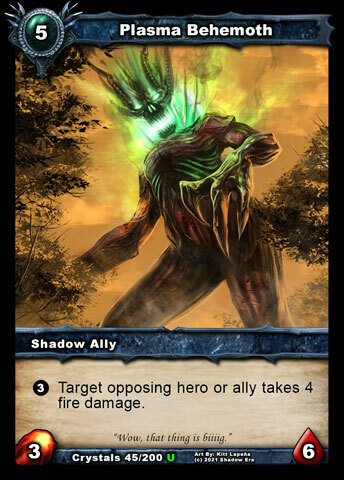 Cannot convert 2 of the same type of ally however, and Ravagers can use a converted ally as a spring board for their fuel. Dagger of Fate: since Gravebone has for the most part added discard to his game this card has tremendous value. Same cost as fireball but with potential to deal up to 9 damage. Bone Saber: this weapon is tremendous with gravebone. It provides a pseudo haste option for allies summoned, revived or already in the board. It is restricted to undead builds. Tagged discard, Gravebone, Hero Profile, Mage, Sf, shattered fates.